In clinical medicine there are a variety of physiologic measurements that evaluate cardio-respiratory function. Many of these measurements are performed with patients at resting state or while patients carry out simple maneuvers. Prominent examples include spirometry, measurement of lung volumes, pulmonary diffusion capacity of carbon monoxide, pulmonary artery catheterization, and echocardiography. In contrast, exercise testing evaluates the performance status of patients in the context of functional work. Exercise testing encompasses a variety of tests including treadmill testing for evaluation for cardiac ischemia, evaluation of distance walked over time, and cardiopulmonary exercise testing. Cardiopulmonary exercise testing (CPET) is the most comprehensive form of exercise testing. It is an integrative assessment of cardiac, respiratory, skeletal muscle, and metabolic function. In contrast to volitional tests such as 6-minute walk testing, CPET enables evaluation of both submaximal and peak exercise responses. Devices commonly used for patient exercise include stationary bicycle ergometers and treadmills. While treadmills allow patients to exercise without need to learn a new activity (i.e. most adults can walk while not everyone has learned to ride a bicycle), cycle ergometry is often better tolerated by patients with restrictions to weight bearing. Electrocardiograph recording throughout exercise testing evaluates heart rate, heart rhythm, and screens for ischemic changes precipitated by exercise. Blood pressure monitoring evaluates for blood pressure response to exercise and may also identify decline in blood pressure in patients at risk of exertional syncope. Manual blood pressure monitoring is generally recommended for accurate measurement. Pulse oximetry is used as a non-invasive assessment of arterial blood saturation. Evaluation of ventilation, gas exchange, and metabolic rate and function is accomplished through airflow measurement, capnometry, oximetry, and quantification of expired gases. Modern measurement of these parameters is generally accomplished with computerized systems with built-in calibration. Data are derived on a breath-by-breath basis; time averaging of data over 10-20 second intervals is generally performed for the final reports. In selected circumstances, arterial blood gas analysis can also be obtained for further analysis of gas exchange, acid-base status and blood lactate levels. A brief history and physical, medication review, and review of prior diagnostic testing, is useful to understand risk factors for disease states; conditions that may be unstable at the time of testing; as well as conditions that might limit the patient’s capacity to exercise. The indication for exercise testing should be reviewed in concert with history, physical, and review of prior data, to inform pretest probability. Resting heart rate, blood pressure, respiratory rate, pulse oximetry, and electrocardiogram are also useful to characterize the resting health state and to identify contraindications to exercise. Heart rate, blood pressure, pulse oximetry, electrocardiogram, and patient symptoms during exercise, should be monitored throughout exercise testing. Necessary safety equipment in an exercise testing laboratory includes a defibrillator, oxygen tank with delivery devices (e.g., nasal cannula, venturi mask, and non-rebreather mask), oral and nasal airways, bag-valve mask hand respirator, and supplies for administration of medications (syringes, needles, intravenous tubing, solutions, and adhesive tape). The American Heart Association (AHA) also provides a list of commonly used drugs in life-threatening emergency, including a list of required medications. The physiologic measurements obtained during CPET are useful for a variety of clinical questions. In patients with exercise intolerance of unclear cause, testing can elucidate underlying etiologies such as organ system dysfunction and deconditioning. In advanced cardiac or pulmonary disease states, cardiopulmonary exercise testing can provide prognostic information, quantify extent of impairment or response to treatments, and provide information useful for individualizing rehabilitation programs. Other uses of CPET include evaluation of exercise induced asthma, evaluation of pacemaker function, and evaluation of prognosis and perioperative risk in patients who may undergo lung resection. CPET is considered safe, even in the setting of advanced cardiac or pulmonary disease, however, rare complications have been reported. It is important to ensure that the patient does not have acute and/or chronic medical conditions that might significantly raise risks, as outlined by the American Thoracic Society/ American College of Chest Physicians (ATS/ACCP) guidelines in Table 1. During exercise testing, the patient is subjected to increasing amounts of quantifiable work which can be expressed as the external work performed by the exercising muscles (e.g., watts during cycle ergometry) or by the internal work performed (e.g., rate of oxygen consumption). Work is associated with increased oxygen utilization by muscles which is achieved by increased delivery of oxygen to the exercising muscles (increased cardiac output, heart rate and stroke volume), dilation of local vascular beds and increased oxygen extraction from the blood. Simultaneously, blood flow to the pulmonary circulation and ventilation increase to allow uptake of sufficient oxygen to support metabolic demands. Concomitant with the increase in oxygen consumption is an increase in carbon dioxide production, which is eliminated through increased minute ventilation (tidal volume x respiratory frequency). In most healthy individuals, maximal exercise function is limited by the cardiovascular system reaching a maximal cardiac output. Thus, in many clinical settings, the peak heart rate relative to predicted normal for age (predicted value is 220 – age in years) is used to define if the patient reached the end of the test. Healthy adults may report dyspnea and fatigue as reasons for exercise stoppage. The role of the cardiovascular system during exercise is to deliver sufficient quantity of oxygen to the tissues to support the exercising muscles (and to deliver the CO2 produced by the exercising muscle to the lung for excretion). In addition to increased blood flow, the supply of oxygen to the tissues is enhanced by an increase in the quantity of oxygen extracted from the arterial blood. The relevant physiologic principles governing these processes are shown below. During exercise the cardiovascular system generates an increase in cardiac output (CO) that is accomplished by both an increase in heart rate (HR) and stroke volume (SV), as defined by Figure 1, Equation 1 below. The required increase in CO can be illustrated using the Fick Principle which expresses CO in relation to the rate of oxygen consumption (VO2) and oxygen extraction (Figure 1, Equation 2). In this equation, oxygen extraction is expressed as the difference in oxygen content between arterial and venous blood CaO2 – CvO2). The oxygen content, or volume of oxygen carried by blood, is defined as the sum of the oxygen bound to hemoglobin and the oxygen dissolved in blood. For simplicity, the dissolved oxygen can be ignored while patients breathe ambient air since it constitutes a small component (<2%) of the total oxygen content of blood. The quantity of oxygen bound to hemoglobin is then derived using the measured hemoglobin level, the oxygen carrying capacity of hemoglobin, and the oxygen saturation of hemoglobin; since the first two of these factors are constant in arterial and venous blood the quantity of oxygen extracted is reflected through the decrease in oxygen saturation in venous blood as compared with arterial blood (Figure 1, Equation 3). An additional parameter derived from the above data is the ratio of oxygen consumption to heart rate, termed the O2 pulse, that is used as a surrogate for stroke volume. Combining equations 1 and 2 yields Equation 4 as the definition for O2 pulse. See Figure 1. This relationship indicates that the amount of oxygen consumed per heart beat increases with increased SV and/or increased O2 extraction. Accordingly, abnormal changes in the O2 pulse relative to healthy normative values can be used as a surrogate marker of inadequate stroke volume response to exercise. The role of the respiratory system during exercise is to increase the volume of oxygen uptake and carbon dioxide excretion in accord with the needs of the exercising muscles. To accomplish these goals, both ventilation and perfusion of the lungs are increased. 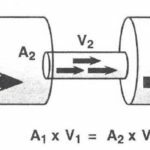 Proportional regional matching of ventilation and perfusion is needed for efficient ventilation and normal gas exchange to enable maximal performance. An increase in alveolar ventilation allows for the required increased uptake of oxygen and excretion of CO2. This increase in alveolar ventilation is accomplished by both an increase in total ventilation and by a reduction in the proportion of dead space per breath (i.e. VD/VT decreases during exercise). In healthy adults, the ability to increase ventilation should not limit maximal exercise capacity. Thus, a sizeable ventilatory reserve exists in healthy subjects which is confirmed by a ventilatory rate during peak exercise that remains below the individual’s maximal ventilatory capacity (i.e. peak minute ventilation remains below the maximum ventilatory volume [MVV]). An inappropriate narrowing of the difference between minute ventilation (VE) and MVV during exercise indicates inadequate ventilatory reserve which is defined by either the ratio or difference between peak VE during exercise relative to the subject’s MVV. To aid in this analysis of the respiratory system in response to exercise, spirometry should be performed before CPET. This allows for determination of the vital capacity (VC), forced expiratory volume in 1 second (FEV1) and maximum voluntary ventilation (MVV). When clinically indicated, spirometry can be repeated after termination of exercise to assess for exercise induced broncho-constriction. With increased levels of exercise there is a progressive increase in both the quantity of oxygen consumed and the quantity of CO2 produced. The cardiorespiratory responses that allow for these metabolic changes are described above. Analysis of the quantity of oxygen consumed per unit of external work can be used to assess work efficiency which can be compared to established normal values. Ultimately with increased work the oxygen supply is inadequate to meet the demands of all the muscles at work, leading to increased use of anaerobic respiration. This leads to increasing lactic acidosis with a corresponding increase in CO2 output due to buffering of lactic acid by bicarbonate. The point at which this transition of metabolism becomes manifest is termed the anaerobic threshold (AT). There are numerous approaches used for identification of the anaerobic threshold including analysis of metabolic parameters per se, analysis of the respiratory response to increased oxygen consumption and/or analysis of the corresponding change in exhaled gas composition. A detailed description of these methods is available in either the review articles or Wasserman exercise textbook cited below. In clinical practice, one or more of these approaches may be needed to best identify the AT. The anaerobic threshold by definition is associated with less aerobic ATP production and decreased ability to tolerate further increases in work rates. Maximal exercise capacity is defined by the peak VO2 achieved, which can be compared to normal values. A variety of variables are frequently included in CPET reports. The exact format of a given report will reflect the specifications of the local laboratory. In general, a mixture of tabular and graphical data is displayed. Common parameters include those listed in Table 2. The text by Wasserman and colleagues provides detailed flow charts for interpretation of cardiopulmonary exercise testing that will be briefly summarized. Analysis should start with the measurement of peak VO2. If peak VO2 is normal but exercise intolerance exists, possibilities include patient anxiety about their symptoms or their health, or early heart or lung disease. Alternatively, patients with excessive obesity may require increased metabolic rate at low activity levels which can be confirmed during unloaded cycling. To detect early stage cardiovascular or pulmonary disease, a high index of suspicion is needed as other signs of abnormal physiology are investigated. These include evaluating the ECG for ischemia, checking for excessive hypertension during exercise, ensuring adequate peripheral pulses to identify undiagnosed peripheral vascular disease. 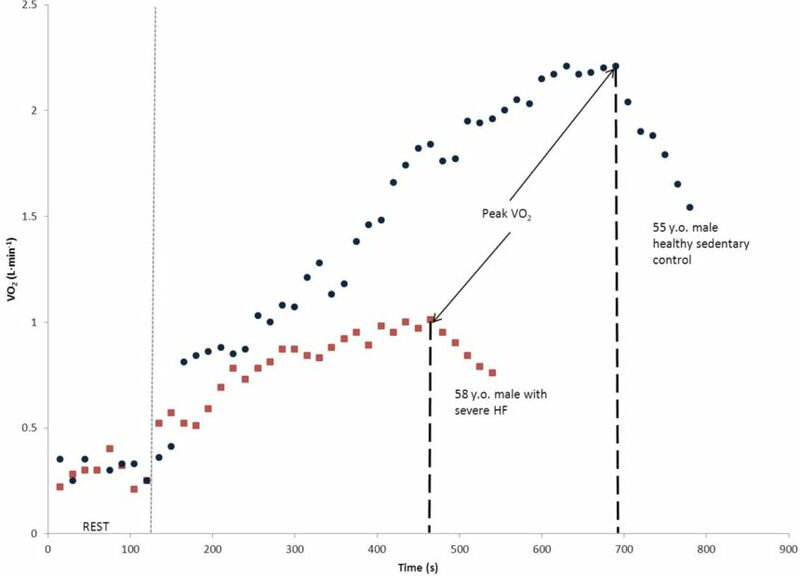 Plateau of the O2 pulse below that which is predicted by normal values, at submaximal exercise, coupled with a heart rate rise out of proportion to the VO2 towards the end of exercise, could suggest impaired SV response to exercise as a manifestation of underlying heart disease. Underlying lung disease can be identified by a reduction in ventilatory reserve which may be accompanied by abnormalities in gas exchange. In patients with pulmonary vascular disease, common findings include an increase in dead space ventilation relative to tidal volume and abnormities of gas exchange (e.g., increased difference between arterial and end-tidal PCO2 and/or abnormal A-a gradient). The ATS/ACCP statement on CPET provides a full list of resources that provide normal reference values, including the most commonly used reference values from work by Jones and colleagues and by Hansen and colleagues (see ATS/ACCP statement tables 12 through 15). Congestive heart failure: Exercise capacity is limited by left ventricular cardiac output. Respiratory disease: Exercise capacity is limited by mechanical abnormalities that limit the increase in ventilation and/or by gas exchange abnormalities. Pulmonary vascular disease: Exercise capacity is limited by right ventricular cardiac output. Neuromuscular disease / poor effort: In both these conditions exercise capacity may be limited, but there should be no evidence for cardio-pulmonary dysfunction. Note, the data cannot distinguish between reduced exercise capacity from generalized weakness vs. volitional reduction in effort. Given the myriad of potential indications for cardiopulmonary exercise testing, a comprehensive review of the evidence for the utility of CPET is outside the scope of this review. CPET has been shown to have prognostic value in a variety of disease states. In patients with ischemic and dilated cardiomyopathy, achievement of a peak VO2 > 50% of the predicted maximal value has been connected to favorable short term prognosis, obviating the need for urgent heart transplant and has been shown to be of prognostic value in a variety of other heart failure populations. In patients with COPD, endurance testing (performing work at a constant, sustainable work load) rather than incremental testing is a more useful CPET measure of functional status and correlates with improvement after therapeutic interventions including pulmonary rehabilitation. In interstitial lung disease, CPET is uncommonly used to monitor disease progression, however small studies show prognostic value of several measurements during CPET. Pulmonary gas exchange markers including A-a gradient during exercise, can be predictive of future disease progression. Peak workload and nadir oxygen saturation can also be used as a supplement to measurement of vital capacity for assessment of disease progression and have been shown to correlate with one year mortality or need for transplant. In post-transplant settings, CPET has been shown to be useful in clarifying exercise limitation; for example, a small cohort of post-lung transplant patients were found to have exercise tolerance not limited by ventilation or gas exchange but rather non-respiratory onset of early lactic acid threshold and muscle weakness. Cardiopulmonary exercise testing exists as a thorough physiologic evaluation of multi-organ system work performance. Its main limitation is its limited availability given the need for specialized equipment and staffing, and the potential patient specific limitations to performing work on treadmills or cycle ergometers. More readily available exercise assessment tools include non-invasive exercise assessment for cardiac ischemia with treadmill testing, but this test does not provide the comprehensive multi-system assessments of a CPET. Low technology tests, such as the 6-minute walk test, are commonly used in chronic respiratory diseases, but these assessments are volitional and do not provide insight into either maximal exercise capability or mechanisms for exercise limitation. Thus, for dyspnea of unclear etiology or exercise intolerance that may be multifactorial, these other modalities of exercise assessment are by definition inadequate. As documented by the AHA, major complications of exercise testing include death, myocardial infarction, arrhythmia, hemodynamic instability, and orthopedic injury. Significant complications are understood to be rare however, with reported morbidity rates of <1 in every 5-10,000 tests, with death estimated at 0.5 per 10,000 tests. However low the frequency of complications, the potential for significant complications necessitates proper patient assessment prior to CPET, medical supervision by trained professionals during CPET, and preparedness for emergencies.